The Pacific halibut has become my white whale, and I am its Ahab. I’ve caught a great many of North America’s various flatfishes, starting with a boyhood spent catching winter flounder and fluke in New Jersey, all the way up to landing a giant Atlantic halibut on the Stellwagen Bank off the coast of Massachusetts. That was one of the most memorable fish I’ve ever caught, but since then the Atlantics have become endangered. But their cousins in the Pacific, Hippoglossus stenolepis, remain strong and sustainable. Ever since I moved to California a decade ago, I’ve wanted to catch one. Even a small Pacific halibut weighs more than 20 pounds, and catches of 100 pounds are not uncommon. And they grow far larger. The biggest Pacific halibut ever caught on rod and reel was 459 pounds, and the largest ever landed was a 533-pound behemoth — caught on a long line in Alaska in 2003. This is the “barn door” of legend. Fishing for halibut is more or less like fishing for any flatfish: Weight enough to hold the bottom, a long leader with a baited hook. Pretty simple, really. You drift along the sandy or muddy bottom until you drag your bait past a flatfish. And these fish, being ambush killers, tend to bite hard and fierce when they do; the dainty little winter flounder being a notable exception. I’ve caught untold numbers of fluke along the Eastern Seaboard, and halibut are essentially really, really big fluke. So instead of the 4 ounces of lead I was used to, we used 3 pounds! And instead of a pennant of squid with a shiner as bait, we used whole mackerel. Fluke tend to live in shallow water. And even the Atlantic halibut we’d caught back in the day were in about 150 feet of water. Here we were fishing between 200 and 300 feet of water, and the truly large ‘buts live in water closer to 150 fathoms — that’s an astonishing 900 feet. Ever reel in a 3-pound ball of lead from 300 feet down? It ain’t fun. Can’t imagine 900 feet. So I headed up to Oregon. Travel Oregon had invited me up to Depoe Bay to fish with Capt. Loren Goddard of Dockside Charters. I’d get two days on the water. Surely we’d catch one, right? The first day we headed out in sloppy, foggy seas with my new friends Justin Wills, chef at Restaurant Beck, and Sam Saltos, an Oregonian chef now living in Chicago. Neither had fished the ocean before. I could see it would be a tough day. The wind was blowing 15 to 20 knots and the swells were 4 to 6 feet. 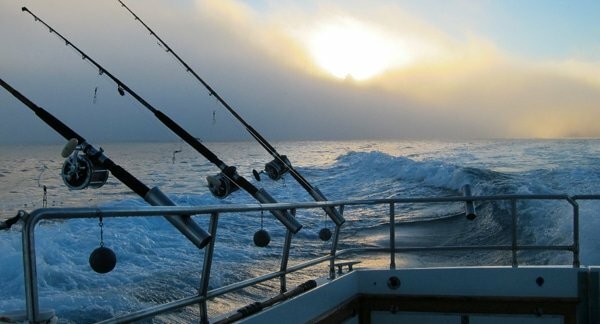 When we set up, we soon saw that the wind and current were working in the same direction, making our drift somewhere around 1.8 knots — basically close to the speed of light when you are drifting bait. Yes, it’s possible to catch fish in these conditions, but not ideal. Poor Sam got seasick, and the bite was just not happening. Again. I looked at Loren and he looked at me, and we decided to call it and fish for rockfish instead. We both wanted Justin and Sam to catch fish on their first trip on the ocean. So we packed it in and did manage to catch our limits of rockfish in less than 90 minutes. The next day broke clear and calm. This time I’d be fishing with Todd Davidson of Travel Oregon and Greg Robeson of Oregon Bounty. Both were experienced anglers, and while Greg had caught halibut in the past, Todd was mostly a salmon fisherman. The wily Pacific halibut had evaded him, too. Conditions were perfect. Calm seas, a lovely 0.5 knot drift… and bites! It wasn’t long before I felt the rod jerk once. Twice. I opened the bail on the reel and let a little line out; you do this to keep the bait in front of the fish’s face because remember, you are drifting away from him down there. Another tug — wait, wait — one more! I closed the bail and set the hook. Stuck him! I reeled up about a dozen times when it dawned on me that there wasn’t so much weight on the line. Goddamnit. Lost the fish. “There’ll be more,” Loren said. He was right. Both Greg and I had three bites like this apiece. No idea what it could be. Halibut normally inhale the bait, unless they’re small. Sharks? Skates? Gremlins? …only this one weighed no more than seven pounds. In Pacific halibut terms, this is basically a fetus. It was never a question. At seven pounds, this would be a nice keeper California halibut, Paralichthys californicus. But a monster Cali hali weighs 25 pounds. I would not become a baby killer. “Let it go,” I said. Loren smiled. “Score one for dignity,” he chuckled as he let the fish go. I watched it swim back to the bottom and disappear. It would be my last bite. But not the last bite of the day. Todd began the laborious process of hauling a halibut up from 200 feet of water. Sweat beaded on his forehead within minutes, but he made steady progress… until the fish saw the boat and swam halfway back to the bottom. Loren knew this would happen, and waited until the fish took this run before he casually reached for the harpoon. No one said anything, but we were all praying that Todd didn’t have a giant skate on the end of his line. Not that you can’t eat skates, but they’re a poor consolation prize when what you’re seeking is one of the best-eating fish in the ocean. Finally we could see it, and it was indeed a nice-sized halibut. “About 28 pounds,” Loren guessed. Todd brought the fish to just under the surface — never let a flatfish’s head out of the water, or he can spit the hook easily — and Loren jammed the harpoon right through the halibut’s gill plates. He then wrapped a line around its tail. And just like that, we had our first, and what would prove to be the only, halibut on board. Loren was close: Todd’s fish weighed 27 pounds. Not huge, but a good one for Oregon’s coastal waters. As we motored home, I told Todd about my quest. He took pity on me, and gave me some of “mercy halibut.” I gladly accepted — it’s been four years since I’ve had the chance to cook with any kind of halibut, let alone Pacific. Hopefully I can return the favor to Todd someday. I love the color contrast you get with the saffron brine and the vivid green of the salsa verde. Served with some crusty bread, it makes a gorgeous meal for late spring or summer. 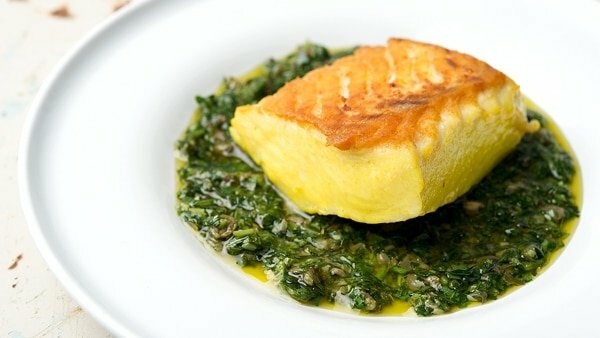 Brining the halibut will give you a little wiggle room in terms of cooking it -- halibut is normally a little difficult to cook because it is so lean. Adding saffron to the brine adds a little flavor and a visual punch. You can skip the saffron if you want. The salsa verde is an all-purpose Italian sauce I've seen used with chicken, rabbit and pork, and when made with red wine vinegar instead of lemon juice, with lamb and beef. It's a little like Argentine chimichurri. Bring the salt and water to a simmer and crumble in the saffron. Stir, turn off the heat and cover the pot. Let this come to room temperature, which can take a couple hours, or speed the process by putting the pot in a large pot that has ice in it. Once the saffron brine is at least at room temperature, if not cooler, submerge the halibut in it and brine in the refrigerator for at least 2 hours, and up to five hours. Meanwhile, make the salsa verde. Put the anchovies, mustard and lemon juice in a bowl and mash it all together until the anchovies are basically a slurry or paste. Add the parsley, garlic, chives, capers and red pepper flakes and mix well. Mixing all the while, slowly pour in the olive oil until the sauce comes together. It should look like a very loose pesto or a thick chimichurri. Add salt and black pepper to taste, cover and leave at room temperature. When the halibut is ready, remove it from the brine and pat it dry with paper towels. Set the halibut out on a cutting board for 15 to 20 minutes to warm up a bit. Spread some salsa verde on everyone's plate. Heat the olive oil in a saute pan large enough to fit all the pieces of halibut in one layer. When the oil is hot, pat the halibut dry one more time and lay the pieces in the hot oil. Cook at a medium sizzle (think about how bacon sizzles and you have the right idea) until a nice crust forms on the bottom, about 8 to 10 minutes. Baste the halibut with the hot oil as it cooks for at least 30 seconds, and longer if you want the interior of the fish to be fully cooked through. After about 8 minutes, a crust should form on the bottom of the halibut. Carefully lift the halibut up (assume it will have stuck, although it usually sticks in one one small place, if at all) and place it, crust side up, in the middle of the salsa verde. Serve at once. If you don't have halibut, use any large, firm white fish. 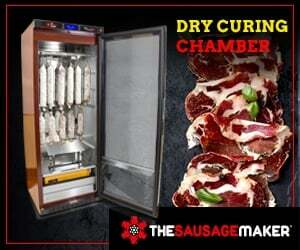 Note that the prep time does not include brine time. That recipe looks great. 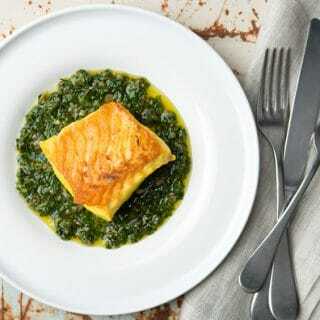 I love halibut just pan fried with capers and brown butter. I just made this for dinner tonight and it’s amazing! I was missing the anchovies, but it didn’t matter, we scarfed it down. Thanks so much for sharing the recipe! 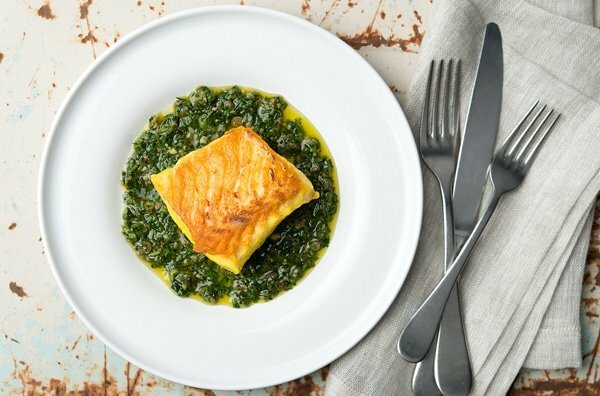 We have lots of ling cod in our freezer from a fishing trip to Canada and I tried it with this recipe and I have to say, it was the best thing I’ve ever done with a white fish. I did find that I had to flip the fish to get it cooked all the way through and then both sides had that nice crust. Perhaps the fish was too thick? This is going to be a regular at our dinner table. Thanks! Such a fun eating experience. My family loved this. They might not have tried it if they saw me making anchovy slurry… But they didn’t. I highly recommend this. I would make this with anything from Northern Pike to Lingcod. Great stuff Hank!